The basic duty of an outside sales consultant is to act as a bridge between the company and the customers, to promote the products and services of the firm by building and maintaining a long-term relationship with the customers. 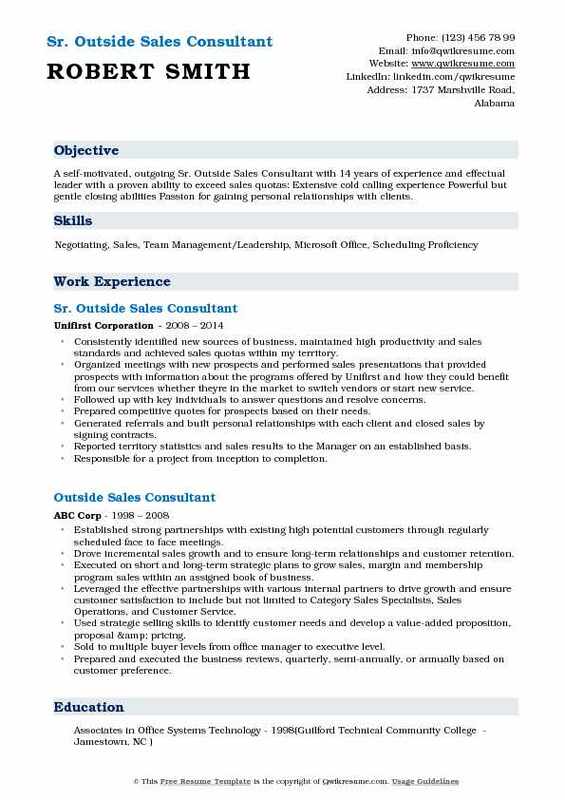 A successful Outside Sales Consultant Resume mentions highlighting tasks such as – understanding the market, product, and its related features, finding customers and converting leads as sales, getting sales through various mediums, forecasting and suggesting various selling techniques, following –up with clients, and finding new target markets. 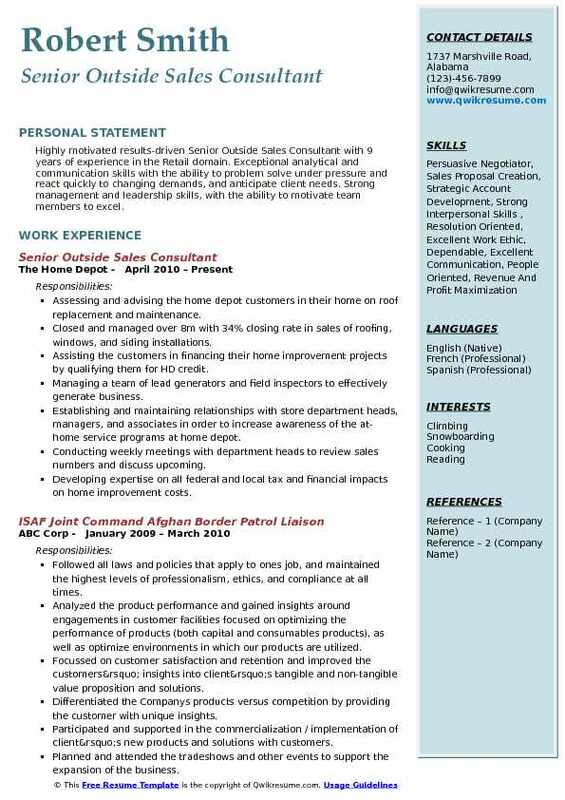 Candidates aspiring to take up this role should mention throughout the resume skills like an ability to build healthy and long-lasting relationship with clients, good communication and negotiation skills, a thorough knowledge of the product and its features, proficiency in sales related software, record keeping skills, the willingness to work as per client’s needs and proven sales expertise. A college degree in areas of marketing or sales is commonplace for most of the outside sales consultants. 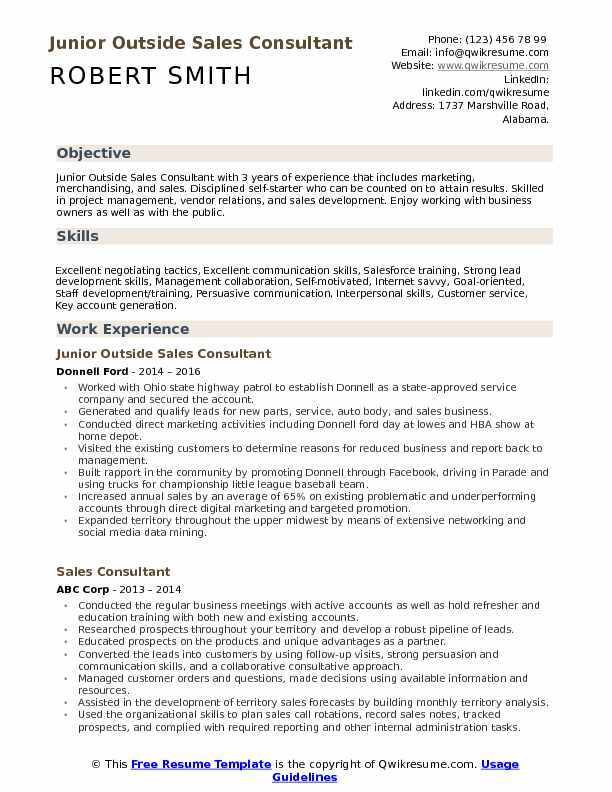 Objective : Junior Outside Sales Consultant with 3 years of experience that includes marketing, merchandising, and sales. Disciplined self-starter who can be counted on to attain results. Skilled in project management, vendor relations, and sales development. Enjoy working with business owners as well as with the public. 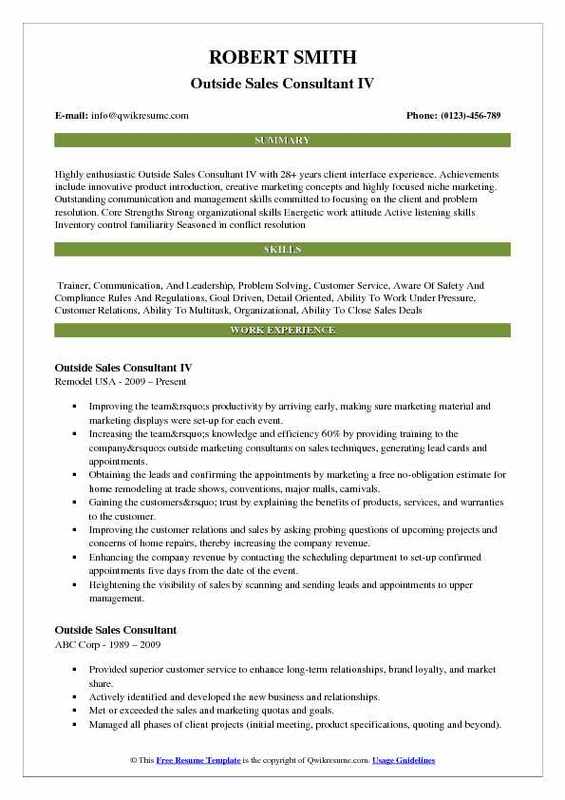 Skills : Excellent negotiating tactics, Excellent communication skills, Salesforce training, Strong lead development skills, Management collaboration, Self-motivated, Internet savvy, Goal-oriented, Staff development/training, Persuasive communication, Interpersonal skills, Customer service, Key account generation. Worked with Ohio state highway patrol to establish Donnell as a state-approved service company and secured the account. Generated and qualify leads for new parts, service, auto body, and sales business. Conducted direct marketing activities including Donnell ford day at lowes and HBA show at home depot. Visited the existing customers to determine reasons for reduced business and report back to management. Built rapport in the community by promoting Donnell through Facebook, driving in Parade and using trucks for championship little league baseball team. Increased annual sales by an average of 65% on existing problematic and underperforming accounts through direct digital marketing and targeted promotion. Expanded territory throughout the upper midwest by means of extensive networking and social media data mining. Scheduled the qualified appointments to inform prospects about our services. 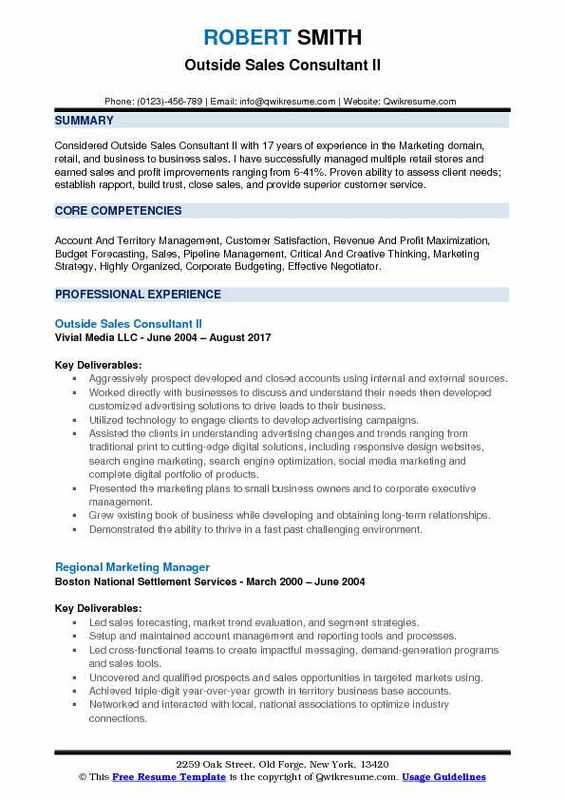 Summary : Considered Outside Sales Consultant II with 17 years of experience in the Marketing domain, retail, and business to business sales. I have successfully managed multiple retail stores and earned sales and profit improvements ranging from 6-41%. Proven ability to assess client needs; establish rapport, build trust, close sales, and provide superior customer service. Skills : Account And Territory Management, Customer Satisfaction, Revenue And Profit Maximization, Budget Forecasting, Sales, Pipeline Management, Critical And Creative Thinking, Marketing Strategy, Highly Organized, Corporate Budgeting, Effective Negotiator. Aggressively prospect developed and closed accounts using internal and external sources. Worked directly with businesses to discuss and understand their needs then developed customized advertising solutions to drive leads to their business. Utilized technology to engage clients to develop advertising campaigns. Assisted the clients in understanding advertising changes and trends ranging from traditional print to cutting-edge digital solutions, including responsive design websites, search engine marketing, search engine optimization, social media marketing and complete digital portfolio of products. Presented the marketing plans to small business owners and to corporate executive management. Grew existing book of business while developing and obtaining long-term relationships. Demonstrated the ability to thrive in a fast past challenging environment. Proven ability to learn advertising business with little training. Entered market producing as a seasoned representative. Was the top producer in the second market assignment of acquiring new accounts. Improving the team’s productivity by arriving early, making sure marketing material and marketing displays were set-up for each event. Increasing the team’s knowledge and efficiency 60% by providing training to the company’s outside marketing consultants on sales techniques, generating lead cards and appointments. Obtaining the leads and confirming the appointments by marketing a free no-obligation estimate for home remodeling at trade shows, conventions, major malls, carnivals. Gaining the customers’ trust by explaining the benefits of products, services, and warranties to the customer. Improving the customer relations and sales by asking probing questions of upcoming projects and concerns of home repairs, thereby increasing the company revenue. Enhancing the company revenue by contacting the scheduling department to set-up confirmed appointments five days from the date of the event. Heightening the visibility of sales by scanning and sending leads and appointments to upper management. 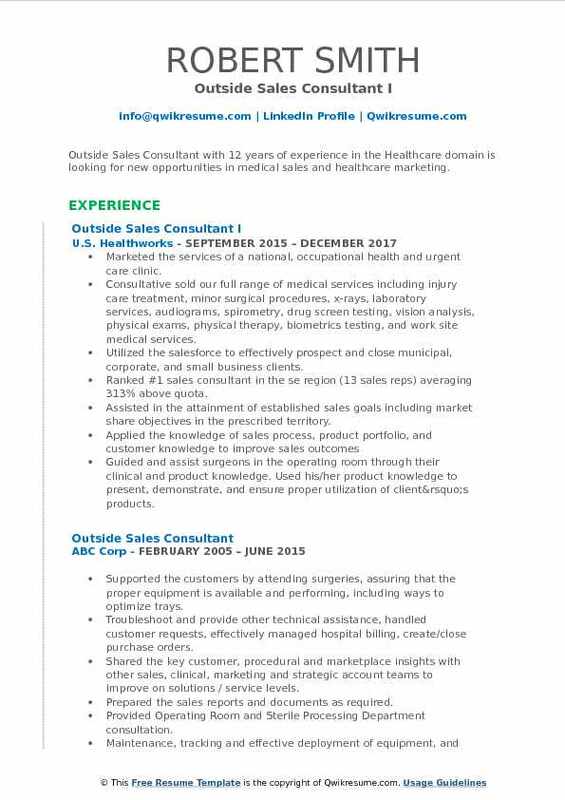 Summary : Outside Sales Consultant with 12 years of experience in the Healthcare domain is looking for new opportunities in medical sales and healthcare marketing. Marketed the services of a national, occupational health and urgent care clinic. Consultative sold our full range of medical services including injury care treatment, minor surgical procedures, x-rays, laboratory services, audiograms, spirometry, drug screen testing, vision analysis, physical exams, physical therapy, biometrics testing, and work site medical services. Utilized the salesforce to effectively prospect and close municipal, corporate, and small business clients. Ranked #1 sales consultant in the se region (13 sales reps) averaging 313% above quota. Assisted in the attainment of established sales goals including market share objectives in the prescribed territory. Guided and assist surgeons in the operating room through their clinical and product knowledge. Used his/her product knowledge to present, demonstrate, and ensure proper utilization of client’s products. 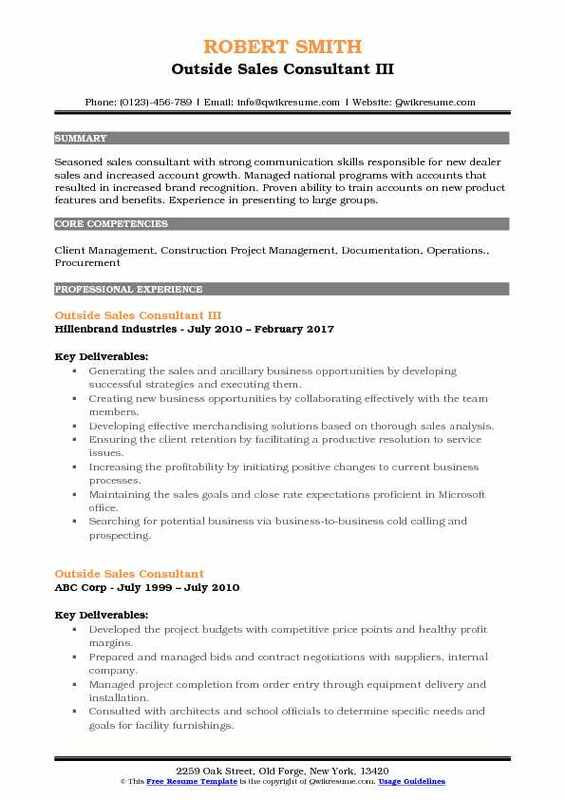 Summary : Highly motivated results-driven Senior Outside Sales Consultant with 9 years of experience in the Retail domain. Exceptional analytical and communication skills with the ability to problem solve under pressure and react quickly to changing demands, and anticipate client needs. Strong management and leadership skills, with the ability to motivate team members to excel. Assessing and advising the home depot customers in their home on roof replacement and maintenance. Closed and managed over 8m with 34% closing rate in sales of roofing, windows, and siding installations. Assisting the customers in financing their home improvement projects by qualifying them for HD credit. Managing a team of lead generators and field inspectors to effectively generate business. Establishing and maintaining relationships with store department heads, managers, and associates in order to increase awareness of the at-home service programs at home depot. Conducting weekly meetings with department heads to review sales numbers and discuss upcoming. Developing expertise on all federal and local tax and financial impacts on home improvement costs. Qualified for annual awards trips for top sales personnel. Highest grossing first-year sales consultant. 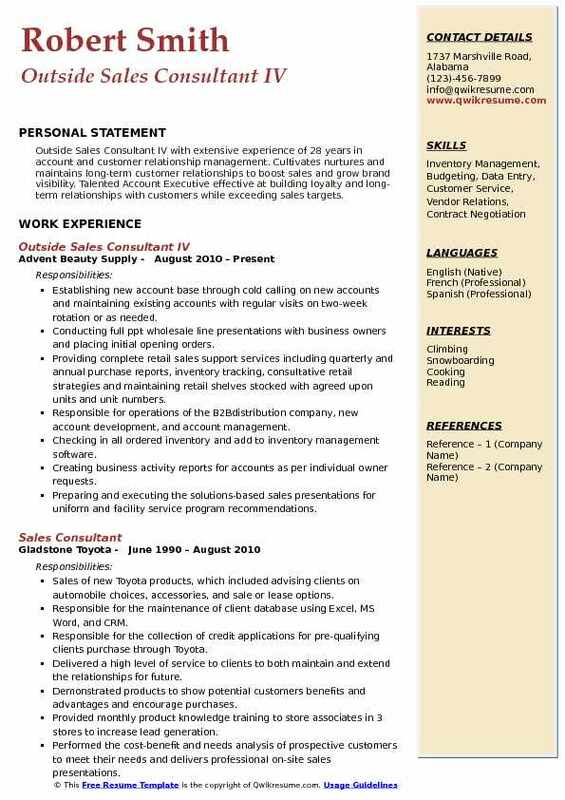 Summary : A self-motivated, outgoing Sr. Outside Sales Consultant with 14 years of experience and effectual leader with a proven ability to exceed sales quotas: Extensive cold calling experience Powerful but gentle closing abilities Passion for gaining personal relationships with clients. Consistently identified new sources of business, maintained high productivity and sales standards and achieved sales quotas within my territory. Organized meetings with new prospects and performed sales presentations that provided prospects with information about the programs offered by Unifirst and how they could benefit from our services whether they're in the market to switch vendors or start new service. Followed up with key individuals to answer questions and resolve concerns. Prepared competitive quotes for prospects based on their needs. Generated referrals and built personal relationships with each client and closed sales by signing contracts. Reported territory statistics and sales results to the Manager on an established basis. Responsible for a project from inception to completion. Provided on a regular basis market information, including competition, new procedures/techniques, products, etc. 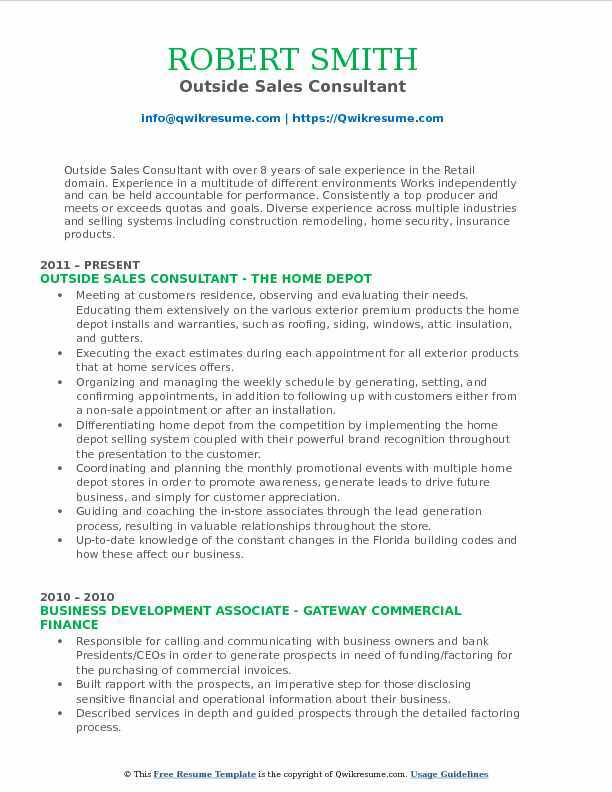 Summary : Outside Sales Consultant with over 8 years of sale experience in the Retail domain. Experience in a multitude of different environments Works independently and can be held accountable for performance. Consistently a top producer and meets or exceeds quotas and goals. Diverse experience across multiple industries and selling systems including construction remodeling, home security, insurance products. Meeting at customers residence, observing and evaluating their needs. Educating them extensively on the various exterior premium products the home depot installs and warranties, such as roofing, siding, windows, attic insulation, and gutters. Executing the exact estimates during each appointment for all exterior products that at home services offers. Organizing and managing the weekly schedule by generating, setting, and confirming appointments, in addition to following up with customers either from a non-sale appointment or after an installation. Differentiating home depot from the competition by implementing the home depot selling system coupled with their powerful brand recognition throughout the presentation to the customer. Coordinating and planning the monthly promotional events with multiple home depot stores in order to promote awareness, generate leads to drive future business, and simply for customer appreciation. Guiding and coaching the in-store associates through the lead generation process, resulting in valuable relationships throughout the store. Up-to-date knowledge of the constant changes in the Florida building codes and how these affect our business. Summary : Seasoned sales consultant with strong communication skills responsible for new dealer sales and increased account growth. Managed national programs with accounts that resulted in increased brand recognition. Proven ability to train accounts on new product features and benefits. Experience in presenting to large groups. Generating the sales and ancillary business opportunities by developing successful strategies and executing them. Creating new business opportunities by collaborating effectively with the team members. Developing effective merchandising solutions based on thorough sales analysis. Ensuring the client retention by facilitating a productive resolution to service issues. Increasing the profitability by initiating positive changes to current business processes. Maintaining the sales goals and close rate expectations proficient in Microsoft office. Searching for potential business via business-to-business cold calling and prospecting. Developing strong relationships with potential clients, customers, and team members. Maintaining the accurate data in the computerized record system, and prepared reports upon request. Responsible for developing creating and sustaining healthy business relationships and a consistent pipeline of revenue with the target market. 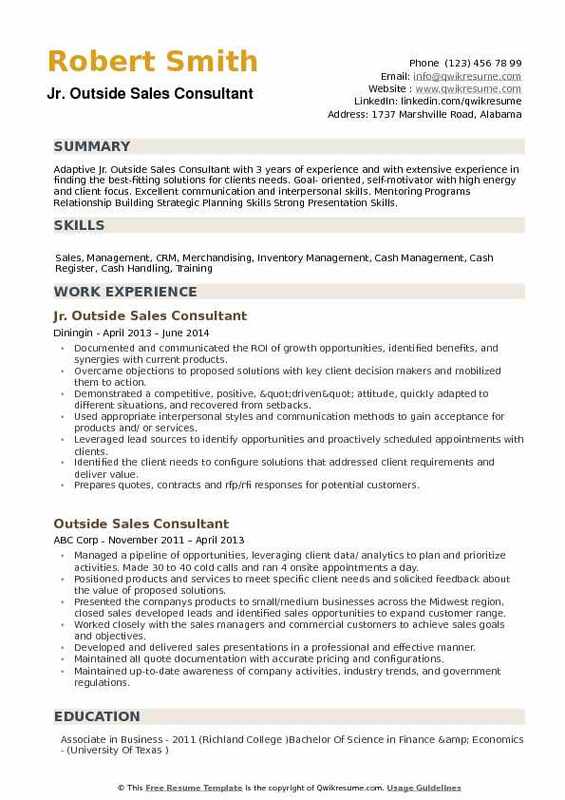 Summary : Outside Sales Consultant IV with extensive experience of 28 years in account and customer relationship management. Cultivates nurtures and maintains long-term customer relationships to boost sales and grow brand visibility. Talented Account Executive effective at building loyalty and long-term relationships with customers while exceeding sales targets. Establishing new account base through cold calling on new accounts and maintaining existing accounts with regular visits on two-week rotation or as needed. Conducting full ppt wholesale line presentations with business owners and placing initial opening orders. Providing complete retail sales support services including quarterly and annual purchase reports, inventory tracking, consultative retail strategies and maintaining retail shelves stocked with agreed upon units and unit numbers. Responsible for operations of the B2Bdistribution company, new account development, and account management. Checking in all ordered inventory and add to inventory management software. Creating business activity reports for accounts as per individual owner requests. Preparing and executing the solutions-based sales presentations for uniform and facility service program recommendations. Determining the cost and pricing of sales proposals. Negotiating up-front setup fees, and preparing the sales contracts and order forms. Objective : Adaptive Jr. Outside Sales Consultant with 3 years of experience and with extensive experience in finding the best-fitting solutions for clients needs. Goal- oriented, self-motivator with high energy and client focus. Excellent communication and interpersonal skills. Mentoring Programs Relationship Building Strategic Planning Skills Strong Presentation Skills. Documented and communicated the ROI of growth opportunities, identified benefits, and synergies with current products. Overcame objections to proposed solutions with key client decision makers and mobilized them to action. Demonstrated a competitive, positive, "driven" attitude, quickly adapted to different situations, and recovered from setbacks. Used appropriate interpersonal styles and communication methods to gain acceptance for products and/ or services. Leveraged lead sources to identify opportunities and proactively scheduled appointments with clients. Identified the client needs to configure solutions that addressed client requirements and deliver value. Prepares quotes, contracts and rfp/rfi responses for potential customers.